LinkChecker enables you to check the validity of links on a page with a couple of clicks. The extension moves through the page and gives each link a background colour (green for valid etc). It is something that I do quite often and the ability to see valid and invalid links in a colour coded way is really useful, particularly if you have a few personal sites that contain many links. I also find LinkChecker useful when I am asked to work on a website that I am not familiar with; it means I can quickly check page and document links for the client. 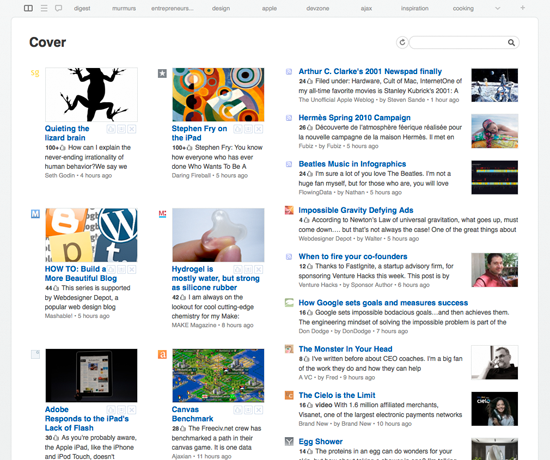 I use Google Reader a lot and it’s a functional RSS reader. However, even its biggest fan will say it’s not so pretty and, in my opinion, it’s rather old-fashioned in its approach. That’s where Feedly (download) comes in. It organizes your favorite RSS sources in a magazine-like start page and integrates with Google Reader, Twitter, and other web services. Feedly has a variety of layouts (digest, latest, most popular etc) and it makes browsing and organising RSS feeds a dream! I love it! Rank Checker is an extension that enables you to check where your website ranks in the search results. It searches Google, Yahoo (USA and international) and Bing search engines for your domain against specific search terms that you enter. The results show the position of your website for those terms. It makes this task so much easier. The best things about the extension though is that you can repeat the process on different dates, store the information, and export as a spreadsheet (perhaps to report back to your client?). With a bit of spreadsheet manipulation you can graph/chart the results as well. The end result is an easy way to track the effectiveness of your website optimisation/SEO campaign. I find this particularly useful when I launch a new website and want to track the search engine positions over the first few months. Sure, there are paid services that do this but the (free) Rank Checker extension works really great! Have you ever wanted to take a few simple website measurements when you are working on a layout? Measure It allows you to draw a ruler across any web page to measure the width, height, or alignment of page elements in pixels. You can also move/nudge the ruler in 1px and 5px increments. Simple but effective. Stylish is a great way of managing user styles. For example, if you just hate that font/color/style for a specific website – or even if you just want to try something different for a while – Stylish lets you change the style for that website and manage the styles you create. In addition, there is a companion website that has many user styles from other Stylish users for you to try. I am not suggesting that you go overboard with user styles but they can be useful on some occasions. For example, I tried out the BBC website with different fonts since I am not the biggest fan of Verdana…. or you may have a font that you want to try out on your own website for a few weeks (perhaps before you change fonts). Stylish will let you do that. There are thousands of Firefox extensions and I’m sure there must be lots that I don’t know about. What are your favorite ‘unknown’ Firefox extensions? Having recently looked at extensions available fro Chrome it’s certainly interesting to see what great Firefox ones are available. Firefox still appears to be the browser of choice for many developers, so it is no surprise there are so many great and useful development extensions available for it. Out of those covered here, I think ‘Measure It’ is probably one of the most useful, as there are numerous times as a developer when you want to find out the pixel sizes of on screen elements. ‘Stylish’ also seems equally practical as experimenting with fonts is something that can make a big difference to the feel of a page. I’ll be interested to see what other users recommend, as there are numerous developer extensions available that are all worth checking out. Very helpful tools, thanks for this post. I’ve recently had problems getting Page Rank Checker to work in Firefox 3. Anybody got similar problems?